Do you (or your students, if you're a teacher) know why the AiDS-causing virus, HIV, is called a retrovirus and how it actually uses the material and machinery of the "host" cell it has invaded to reproduce itself? Do you (or they) have a firm idea what the terms "minus strand, PBS, PPT, and LTR" mean? What does tRNA have to do with retroviruses, anyway? The simulations of OnScreen Retrovirus use the 3D nucleic acid models of our highly regarded DNA apps to make memorable the crucial steps by which the reverse transcriptase enzyme complex of a retrovirus uses nucleotide building blocks of the host cell to copy the viral genome, initially on a single strand of RNA, to a newly constructed double-stranded DNA molecule, ready to be inserted into the host's DNA as a source of new copies of the virus. The goal of this app is to convey the conceptual details of the viral genome transfer from RNA to DNA without requiring of the user a deep prior knowledge of molecular biology. 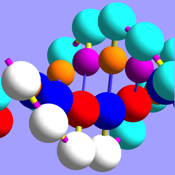 Since a ball-and-stick model of nucleic acids is used for the simulations, this is not done at the level of atomic detail, but the simulations are never in conflict with the biochemistry. Unlike other simulations you might see on the internet, this app shows how the DNA synthesis is at every stage a three-dimensional double-helix-forming process and that it involves several steps, which include the separation of strands and the relative movement of the strands to allow annealing to each other at complementary sections, the steps being dependent on three separate activities of the reverse transcriptase complex: RNA-dependent DNA synthesis, RNA degradation, and DNA-dependent DNA synthesis. The role of the virus's nucleocapsid protein as enhancer of the annealing of strands is also indicated. Since retrotransposons--which we all have in our DNA!--make use the very same steps to make new copies of their DNA through an intermediate RNA strand before inserting it at another spot in the cell's DNA, the app serves as a simulation of how they work as well. Background material on viruses, nucleic acids, and enzymes, as well as commentary on each new step in the process of copying the single strand of RNA into a double-stranded DNA molecule are at your fingertips in the app. You can run the simulations with automatic pauses at key steps for convenience in reading of the commentary for the steps or straight through, pausing only when desired. Whether for first-time learning, clarification of ideas previously encountered, or review, OnScreen Retrovirus is now at your service.